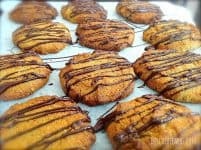 Why did I develop nut free peanut butter cookies? Our school has a nut free policy so trying to find low-carb baking that my children can take to school is pretty tricky. And even though peanuts aren’t actually nuts (they’re legumes) peanuts are generally included in most schools nut free policies. I have so many readers with nut allergies who are always asking for more nut free recipes, cakes and biscuits. So here is another recipe for you to keep on hand. Many wheat free, or low carb recipes call for ground almonds (which isn’t permitted) or uses a large amount of coconut flour which has quite a strong flavour and an ‘odd’ texture. 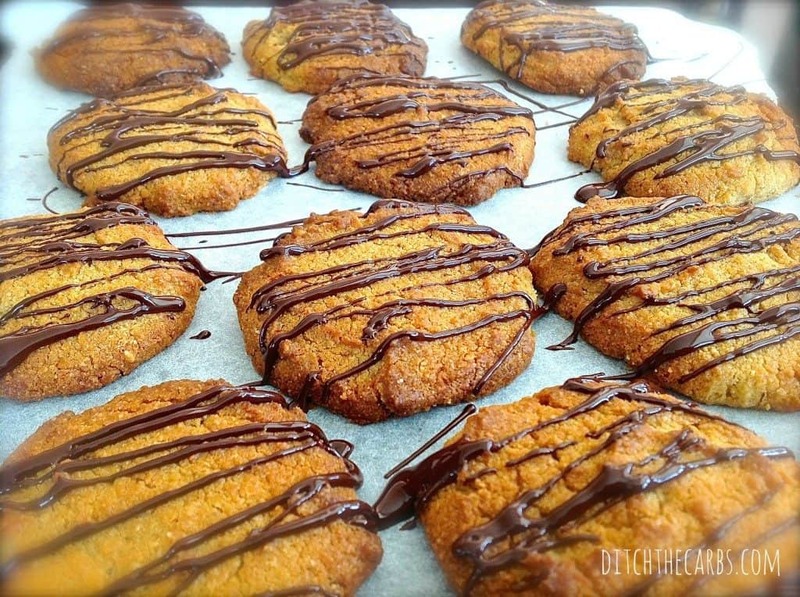 These nut free peanut butter cookies solve both these problems. The tahini is a seed butter so is allowed at school, the coconut flour is overpowered by the tahini nutty taste and the texture is acceptable as there isn’t much in these cookies. Once they are drizzled with chocolate, they look pretty special. 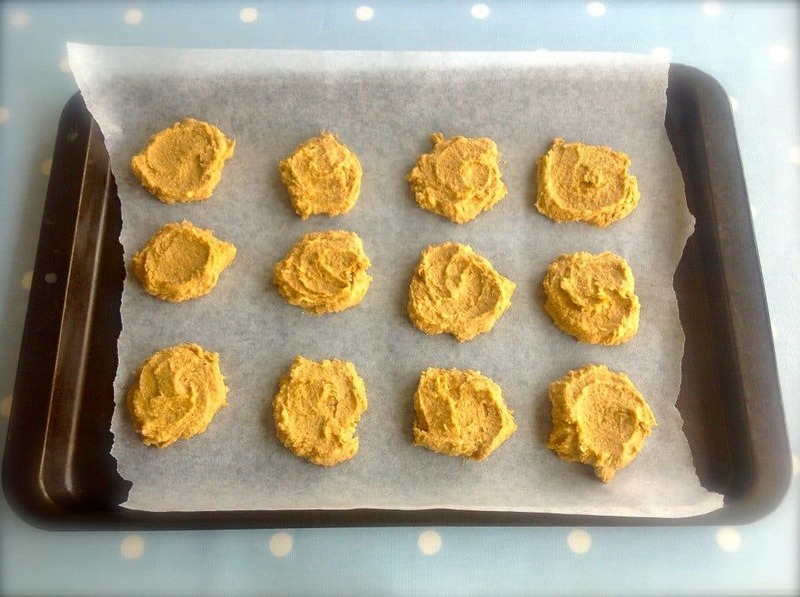 Nut free 'peanut butter' cookies are such a simple idea. Use sesame seed paste (tahini) instead for that nutty flavour. In fact, you can use any nut butter you like and can tolerate. In a bowl, add the softened butter, tahini and sweetener. Cream together for a few minutes until light and smooth. Add the egg, vanilla and mix again until smooth. Add the coconut flour and baking soda. Mix then leave to thicken while you line a baking tray with baking paper. Mix again then place large teaspoons of the mixture on the baking paper. Smooth the top of each biscuit. Bake at 180C/350F for 10 minutes or until golden. Once cooled, drizzle with some melted chocolate. Do you have any recipes that are allergy friendly or can be easily subbed? My toddler son is allergic to dairy, egg and peanuts. It is so hard to find recipes that work and still taste good. Perhaps you didn’t know, or didn’t notice, but you took pains to mention that coconut is not a tree nut, while lumping the peanut in with tree nuts, when it is actually a legume. What type of tahini would work better? Hulled or unhulled? Both work well. I like the unhulled but my children find it a little bitter. I’ve just made these but they are very floppy, my son said they are more like pancakes! Should I use more flour next time? (I used 1/3 of a cup and I have to admit the mixture was quite gooey.) Would it work if I added a bit of cacao? Can I confirm something. In this recipe you state 1/4 cup coconut flour and in the Natvia eBook 1/3 cup. Is there a better option or a simple mistake? Great spotting. The quantity is actually 30g in my notes, which varies from 1/3 to 1/4 cup depending on the source I must have used to convert it (can you see why I hate cups, it is so inaccurate). Coconut flour behaviour varies considerably anyway according to the humidity of your kitchen and how long the bag has been opened. Then there is the size of the eggs you use etc. So add 1/3 to begin with, then add a tablespoon at a time until it is a cookie consistency. 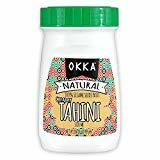 Does tahini have salt or any other ingredients besides ground sunflower seeds? Also, are the seeds roasted or raw? I have raw sunflower seeds and want to make my own tahini for these. Tahini is made from ground sesame seeds not sunflower seeds. You can buy them hulled or unhulled. Some brands add salt but most are 100% sesame seeds. You can see them here. I made these today and they were sooooo dry! I have no idea where or even if I did go wrong! They smelled amazing, looked amazing, just the taste didn’t follow through! Any suggestions, I’m so sad! Where they overcooked? I have never had this problem. Maybe add more tahini or butter next time. You could but you would have to 1: Use much more as coconut flour is so incredibly absorbent 2: They will no longer be nut free. These are so easy to make and very tasteful. The texture could be described as, like we call it in the Netherlands, sand cookies. Yum! I was looking for something low carb to munch in the plane and at the airport tomorrow and saw you’re quick and easy recipe. I had everything I needed in stock, so it was a quick fix. Thank you, I’m going to make them for a high tea party next weekend as well! This is genius! I cannot wait to try these! Thanks for making my LCHF life easier to maintain! my son is highly allergic to sesame … what else can I use instead of Tahini? So does each cookie only have .3 net carbs? I made these cookies today as a first ever attempt at low carb baking. They came out great and there aren’t many cookies left!!! I have 3 young boys aged 8, 6 and almost 4. My 6 year old is type 1 diabetic since age 3 and I’m gradually trying to cut carbs as much as possible to help stabilise the horrible swinging highs and lows. Your recipes are by far the most child friendly and achievable I have come across. Thanks!! Thanks Alyson, that is really kind. That was part of the reason for starting my website because all of the experts seem to be child free! If you eat LCHF, the entire family has to come along otherwise it won’t work, and why would you give them food you wouldn’t eat? There are so many diabetics choosing to go LCHF and their blood glucose control is outstanding. Take a look at Dr Bernstein’s Diabetic University. He is the lovely gentleman who helped invent the blood glucose meter because he was T1 and decades ago you could only get tested at your doctors office! He started experimenting with food and BG and achieved amazing control against medical advice. No one took him seriously because he was an engineer so went to med school. A phenomenal man. Hello Libby, I made the Peanut Butter cookies last night but they are very soft. Is there a way to make them crispy? Cook them at a slightly lower temperature for longer so they will dry out. They don’t crisp as much as traditional cookies. Try using fan bake also, that dries them out too. Hi, just discovered your blog because of the comment you left on mine. Nice to find another low carber! Looks like you have some great stuff here!